In her photagraphies and folders Joke Robaard treats the concepts of presentation and representation, their differentiation from one another and dissolution into one another. In various economic, cultural and social contexts, she investigates how groups and networks form. At the same time, the rules and roles originally attributed to the individuals by an institution are rescinded. The poses that Robaard assigns to the representants in her photographies draw the gaze instead to the connection of appearance and the representation of ideas and ideologies. In addition, art historical references to picture genres—such as the group portrait—are repeatedly incorporated. For the Secession Joke Robaard has developed a new project, Stand-In, which depicts the evolved network of the artists association and its exhibition house using various media—photography, video and a folder. 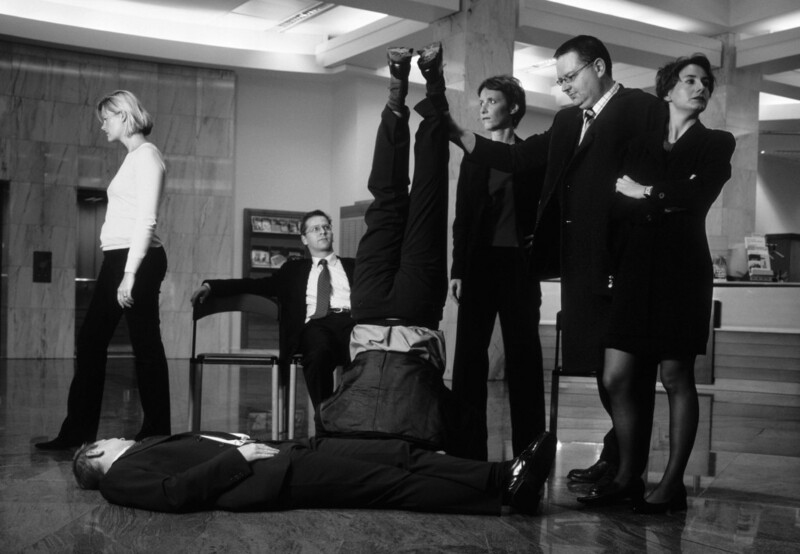 For a series of staged group pictures, the Secession chose (with the ‘help’ of the diagram) seven representative persons from the Secession and three companies that regularly work together with the Secession, and photographed them on site. 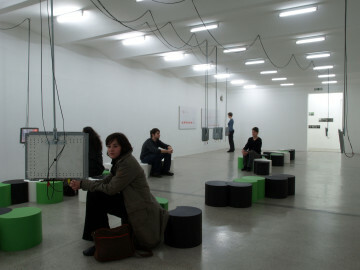 Whereas the characteristic environment, the empty exhibition hall and the reception halls and working spaces clearly refer to the everyday self-understanding and corporate identity of the companies, the photos resist the traditional language of representation through the form in which the people are staged. 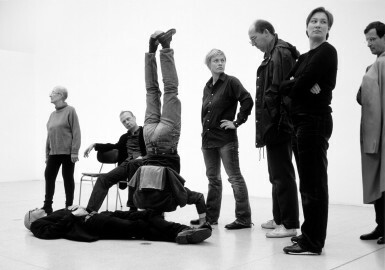 The arrangement of the people is based on a photo that Joke Robaard took about twenty years ago with a group of friends and now repeats and varies in individual settings. In her selection of people to be photographed, Joke Robaard followed a pattern that is typical for her: from a list of all employees compiled by the companies, she selected two persons from the beginning, two from the end and three from the middle of the list. Similar to a colophon, the diagrams developed from this measure the positions of the participants within the network. They are depicted in a folder together with the photographs. With this Folder #43 Robaard continues a working method she has practiced for many years. From an interest in making use of her own artistic practice to establish dialogues and networks, she develops small-format folders that provide a summary of her work in always the same format as take-away objects. As though to reveal and expose the photographic, what is seemingly eventful about the frozen moment, Robaard shows what happens on the set in a video. The general gesture of representation is thus, in a sense, reverted back to the group of individuals themselves. The process of how the individual participants find the pose assigned to them also reveals the discrepancy between an assumed attitude or role and a different, personal self-understanding. In addition to the project Stand-In, a selection of other folders, video documentations and trailers of older projects is also on display. 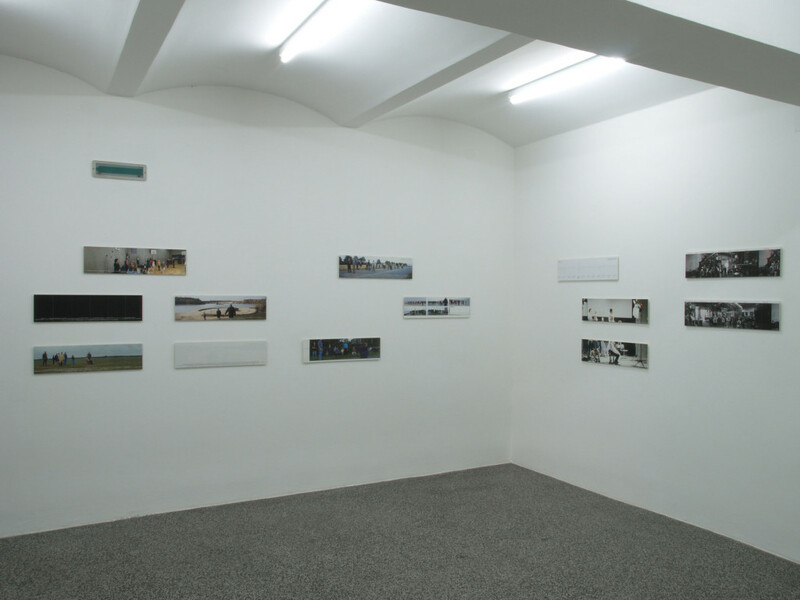 An essential characteristic of the videos is that Robaard operates here with a certain concept of work that is based on the idea of the active picture archive and repeatedly allows for new versions adapted to each current presentation and exhibition form. The conjoining theme of (self-) presentation, body language and the forming of a group is also mirrored in the exhibition design. The stools designed in collaboration with Arno von der Mark for watching the films not only predetermine a certain posture, but can also be pushed together and formed into new arrangements again and again. At the intersection of art, architecture, fashion and design, Robaard thus stages complex panoramas, in which the various discourses are juxtaposed as elements of equal value. Parallel to the exhibition, an extensive documentation of Joke Robaard’s projects since 1988 is published by Valiz, Amsterdam.